Becki Adams Archives - Pebbles, Inc.
Hello Pebbles friends and fans, Becki here to share a set of baby boy and girl cards that I created using the Lullaby collection. I love making cards! Creating cards for new babies is one of my favorite things to do. Of course, when I need to create a card for a new mom or a new baby, I reach for the Lullaby collection. This collection has everything you need (and more!) 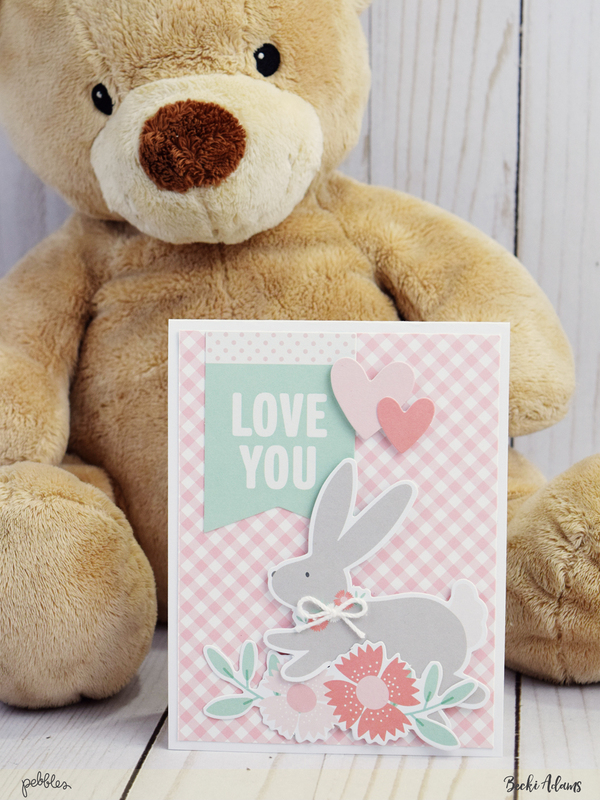 for creating cards, invitations, baby books and even home decor. 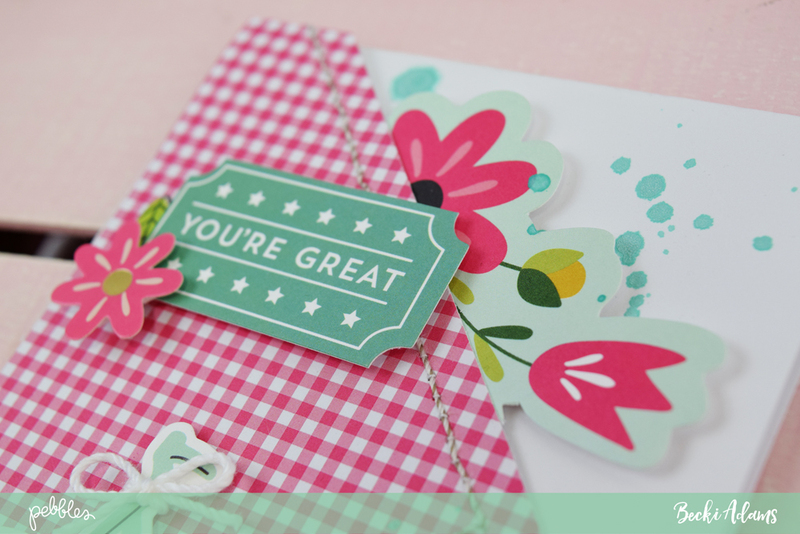 These cards came together so easily with some patterned paper and a few die cuts. To make the creative process easier, I used the same basic design for both cards. 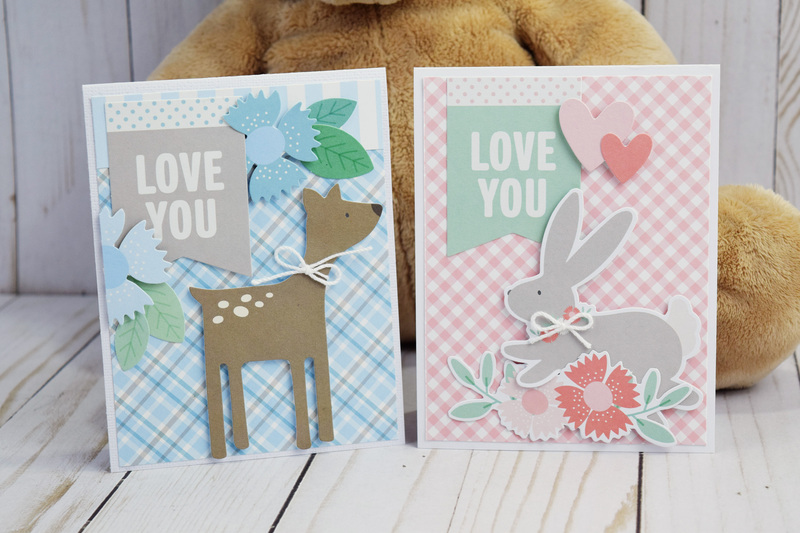 Both cards have a small animal die cut, the “Love You” banner sentiment and a few flower die cuts. To give the cards texture and a little bit of dimension, I added foam adhesive behind some of the die cuts and a white bow tied with white crochet thread to the little animals. 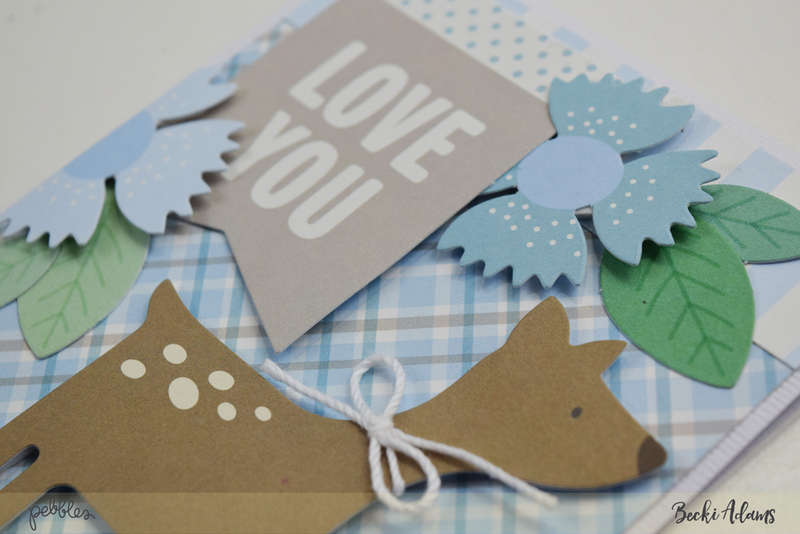 On both of the cards, there are two embellishment clusters (but they are each a little bit different). 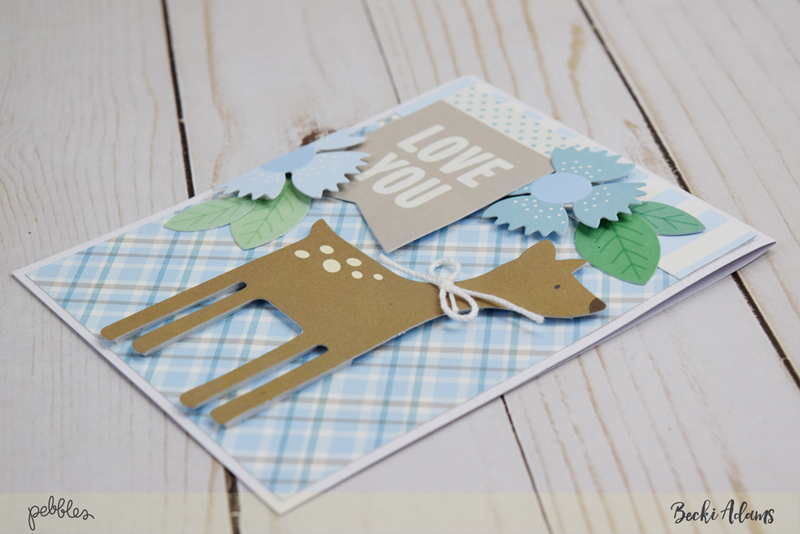 The blue baby boy card has an embellishment cluster on both sides of the sentiment. The little white bow is tied and adhered around the neck of the deer. 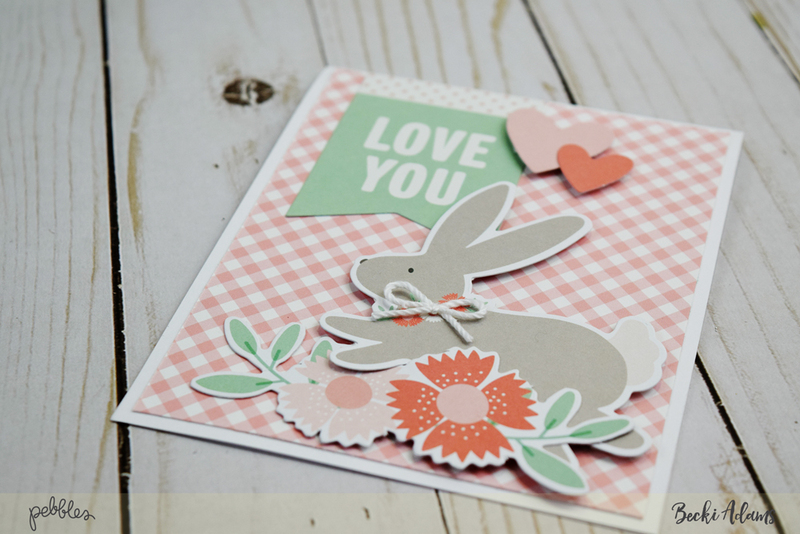 On the pink baby girl card, I added an additional embellishment cluster below the grey bunny die cut. 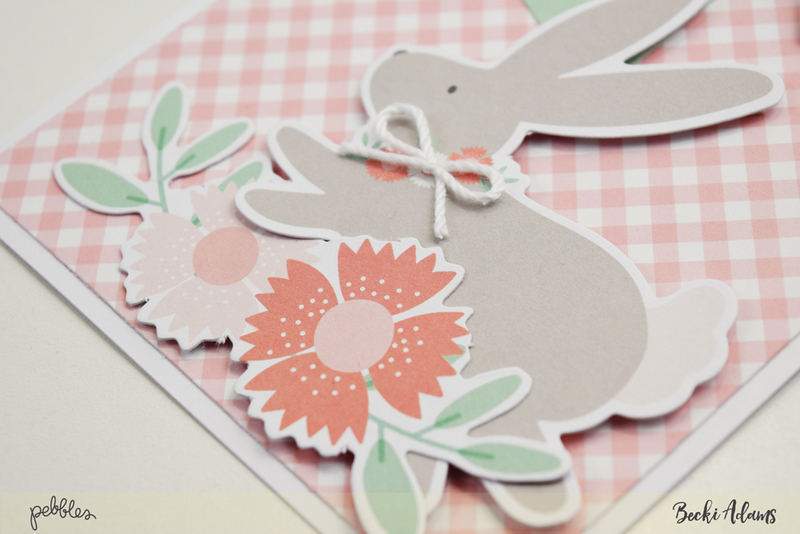 To add a little bit of interest to the card, I tucked the flower die cut underneath the front of the bunny die cut. Both die cuts are adhered with dimensional adhesive. While I don’t know of any baby gifts that I’ll be giving in the foreseeable future, I’m always glad to have cards on hand for those moments when I do need a quick gift. 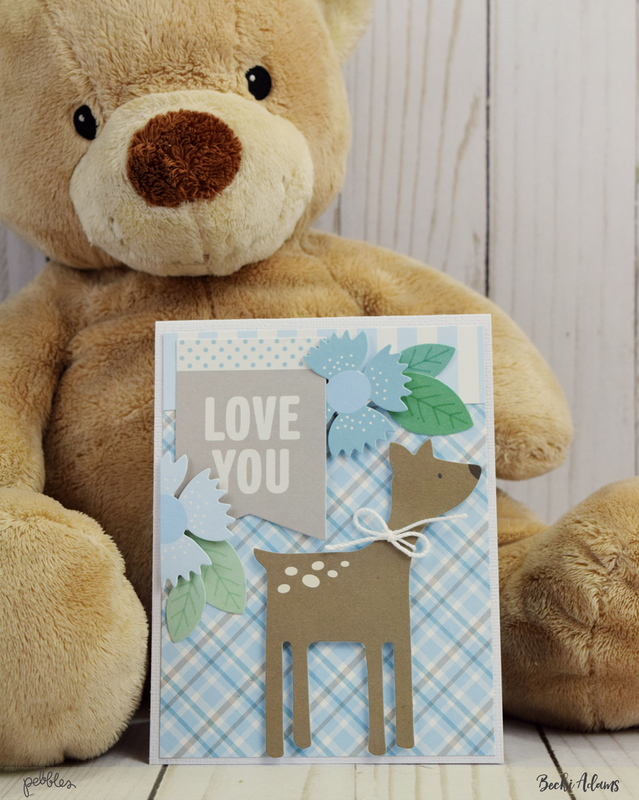 Whether or not you’re in need of a baby card, you’ll love creating with the Lullaby collection. Thank you for stopping by the Pebbles blog today. I’ll see you again soon! Happy crafting! 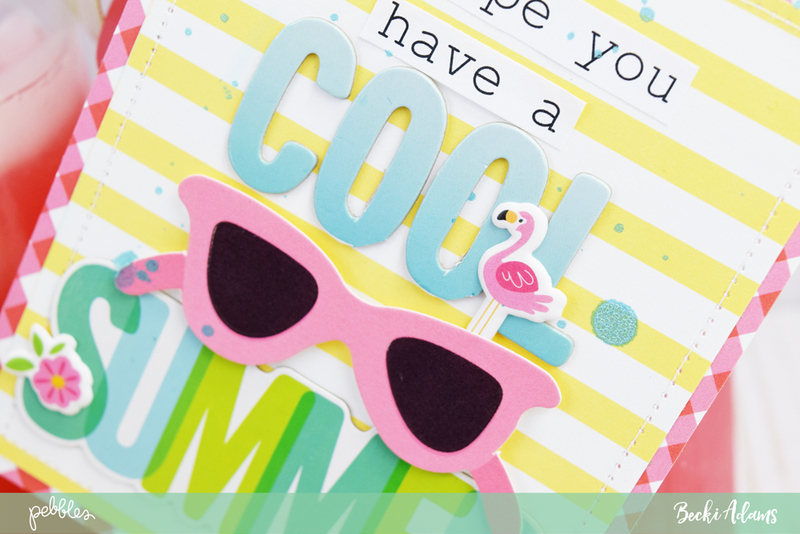 Hello Pebbles friends and fans, Becki here to share with you some Girl Squad Summer-themed Cards. I’ve been dying to dive into the Girl Squad collection. From the moment this collection landed on my doorstep, I was in love! 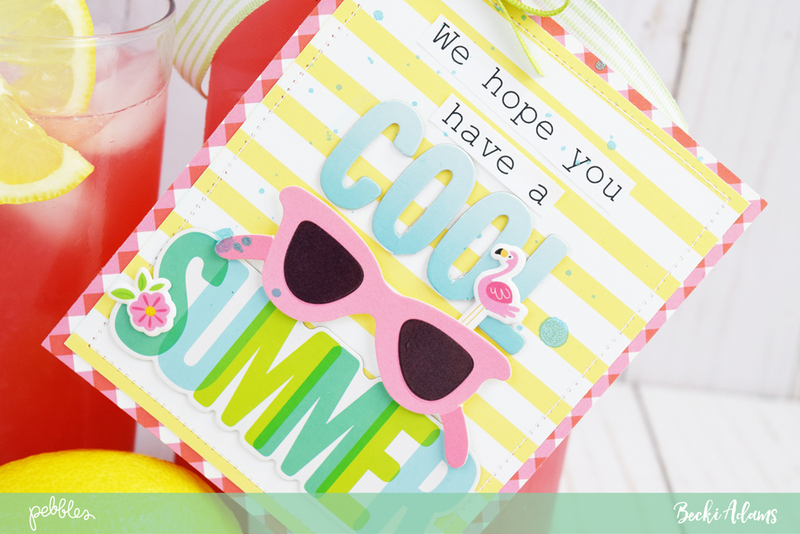 I knew that I could make some amazing Summer cards! 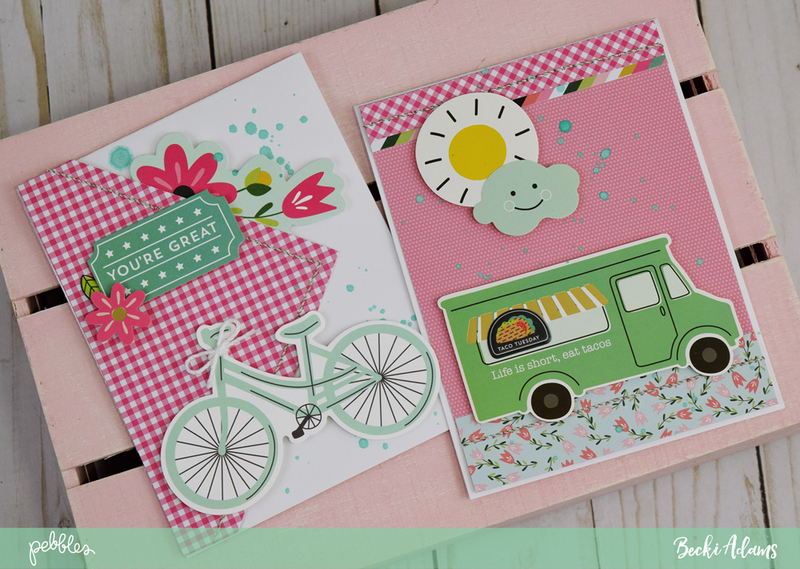 When I started looking through the collection for images to use on my cards, I fell in love with the taco truck sticker and the bike sticker. Those two stickers were “must haves” for this project. 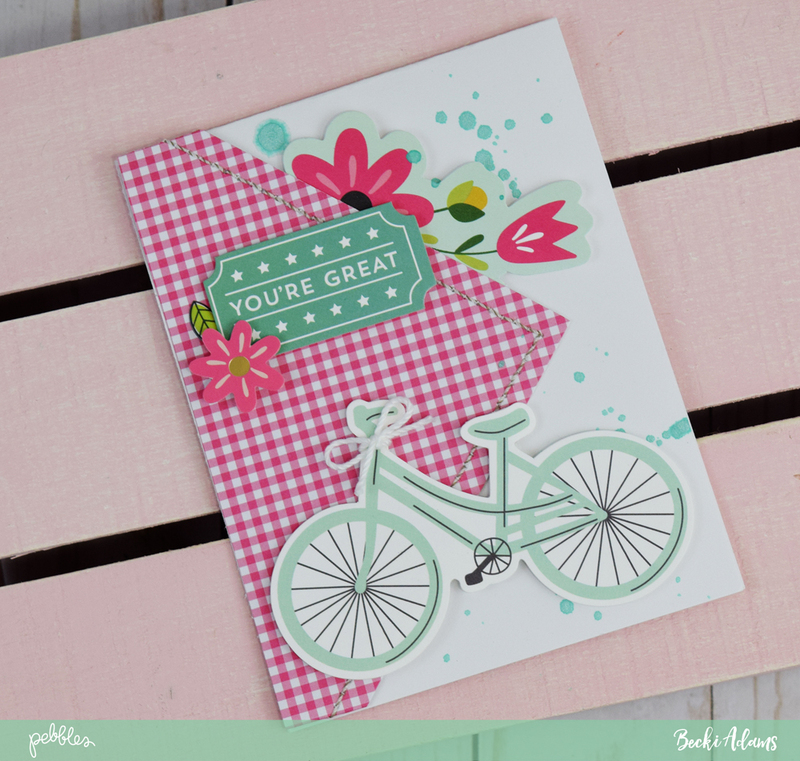 Of course, I used patterned paper from the 6×6 paper pad to create these cards. There are so many great pink patterned papers in the collection. I picked two of them to create these cards. 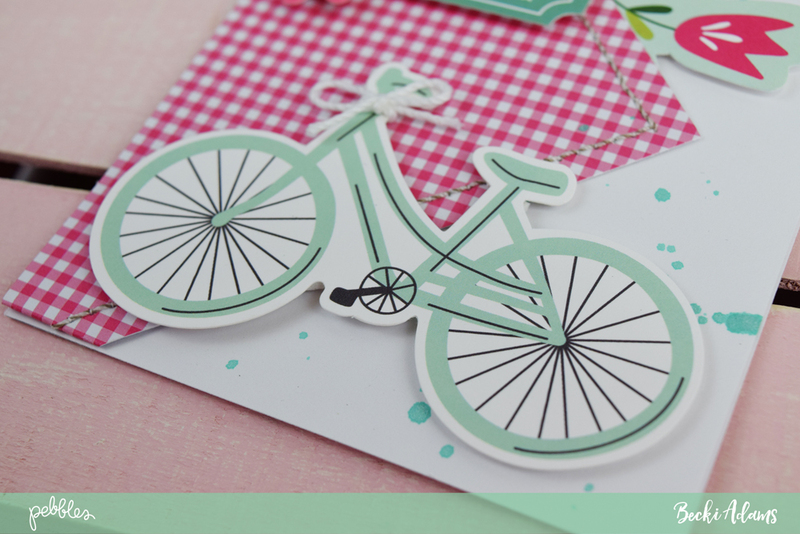 Let’s start with the bicycle card. The Stitch Happy sewing machine from We R Memory Keepers is one of my very favorite tools. I used this machine to stitch around the edge of the pink gingham patterned paper. I adhered the paper so the corner was in the middle of the card and trimmed off the excess with my paper trimmer. Putting stickers onto foam adhesive dots is one of my favorite ways to give stickers a little extra dimension. That’s what I did with the bicycle sticker. That cute sticker needs to pop off the background. At the top of the card, I added a “you’re great” sticker. Once again, I used pop dots to give the sticker some dimension. I cut the flower cluster sticker in half and tucked it under the pink patterned paper. The entire sticker was too overwhelming for a small card. 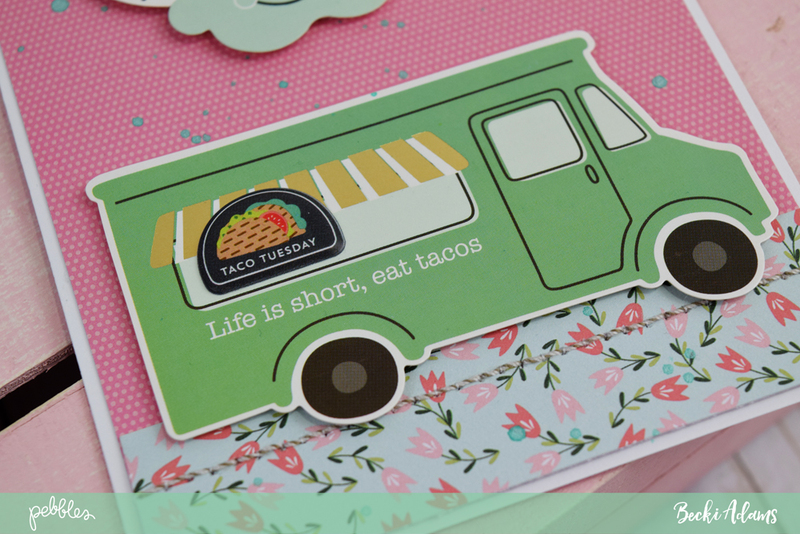 This taco truck card is a personal favorite of mine. It makes me smile whenever I see it. 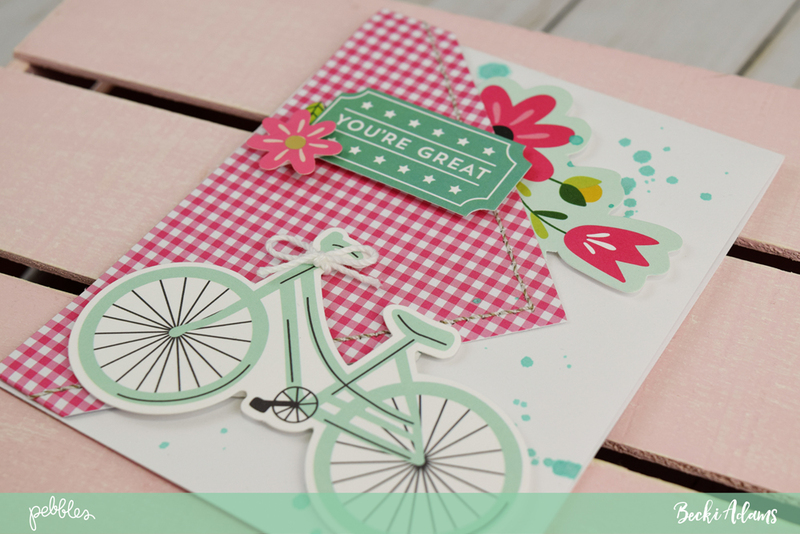 I combined a few different patterned papers to create the background of the card. I did keep the majority of the background pink though—I love pink! I kept the design of these two cards very similar. By keeping the design similar, I was able to create these two cards very quickly. 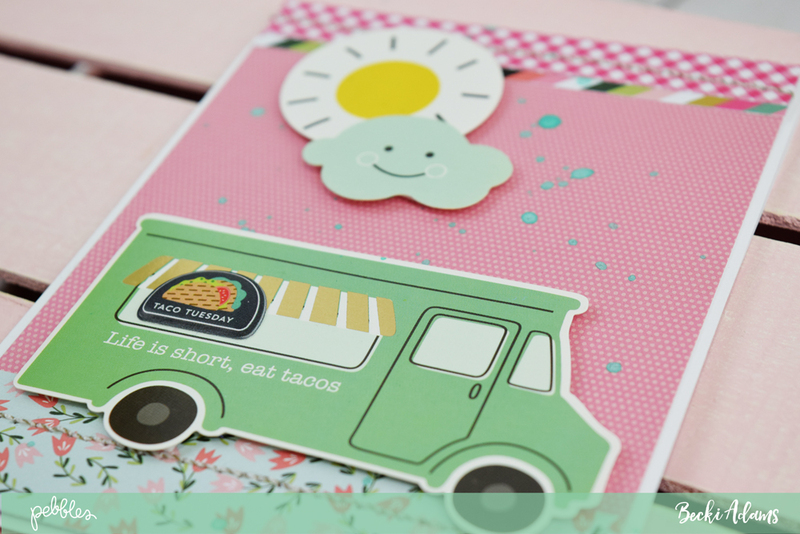 Along the bottom of the card I added the taco truck sticker (on pop dots). 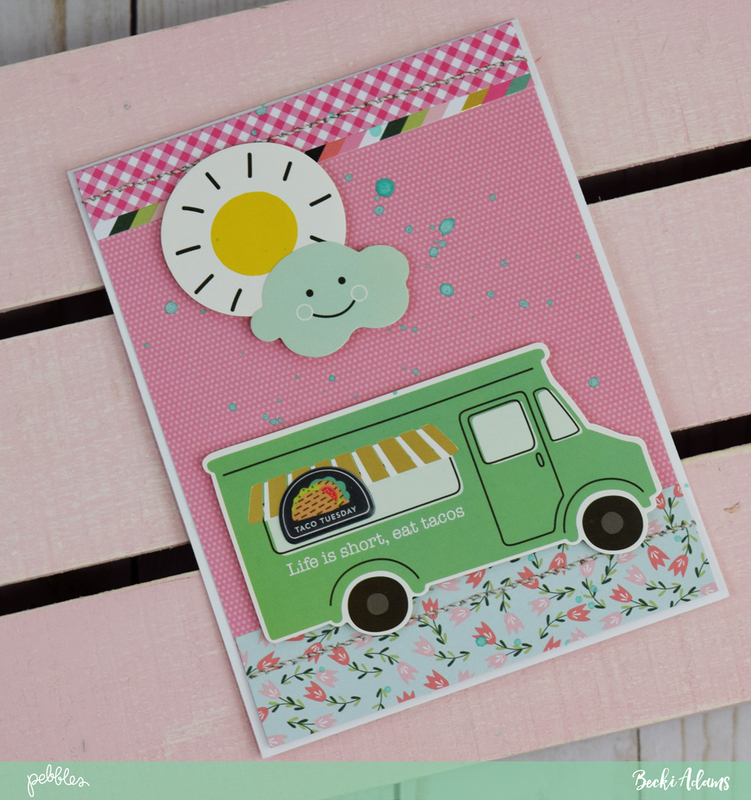 My favorite part of this card is the black “taco Tuesday” puffy sticker that I added in the window of the taco truck. How cute is that sticker?!?!? 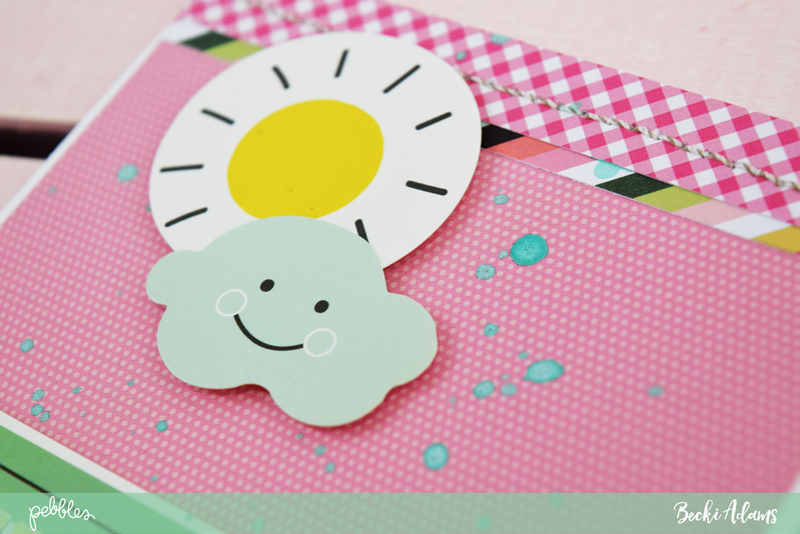 Along the top of the card, I added a sunshine/cloud sticker. I used pop dots to adhere both of these stickers as well. 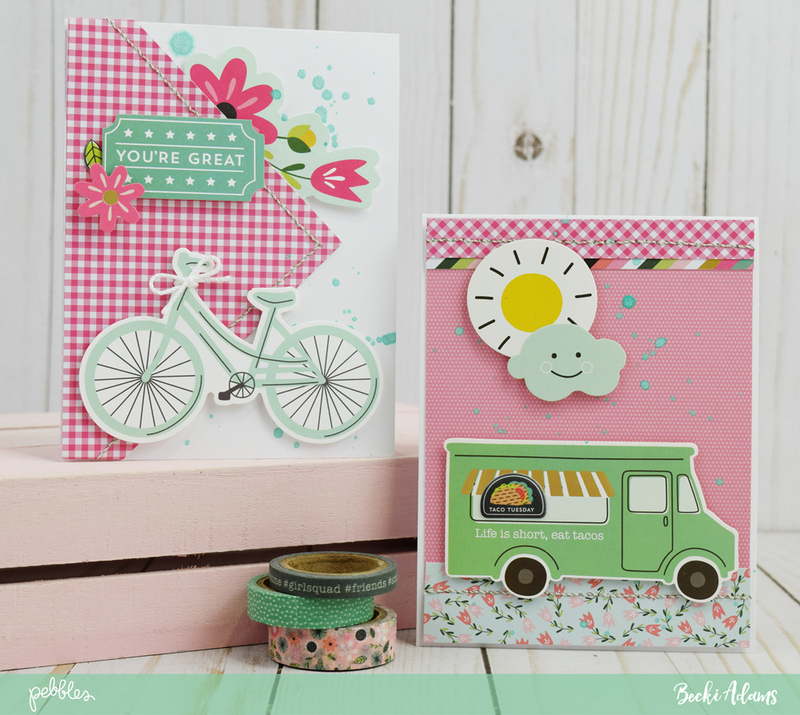 To give both of these cards a little bit of shimmer, I sprinkled some Heidi Swapp color shine on them. I LOVE the finishing touch that the color shine gives to these cards. Thank you for stopping by the Pebbles blog today. Hurry, start creating your Girl Squad Summer cards! You’ll love playing with this fabulous collection. I’ll see you again soon! 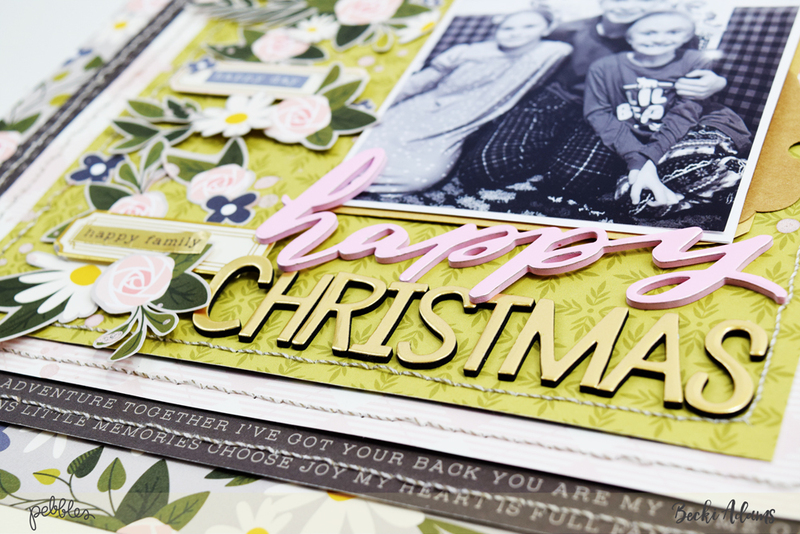 Hello Pebbles friends and fans, Becki here to share a Heart of Home layout entitled “happy Christmas”. When this collection landed on my doorstep a couple of weeks ago, I was giddy!! I fell in love with two things:. 1. the gorgeous shade of green that is throughout the collection and 2. the beautiful floral prints. I made sure to use BOTH of my favorite elements on this layout. The first thing I did on this layout was fussy cut the flowers. I turned on Netflix and cut away while watching one of my favorite shows. 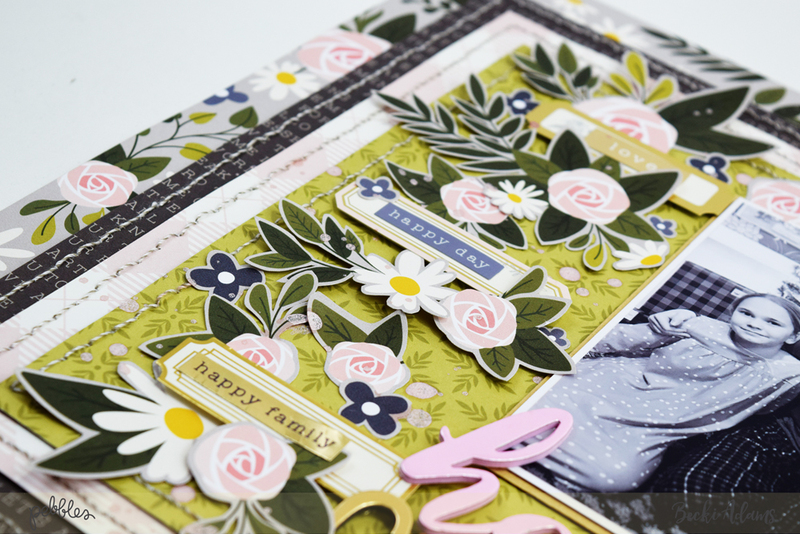 While I cut out flowers, I was thinking about how I wanted this layout to come together. 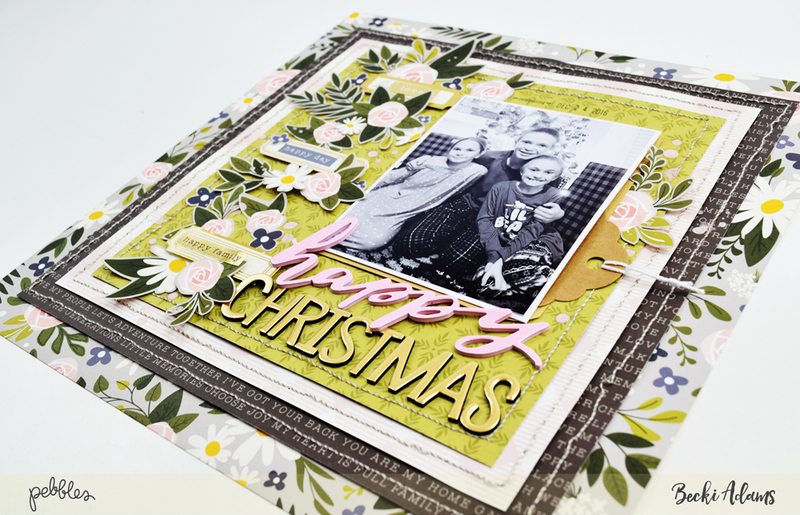 The patterned papers in this collection have such a happy, cozy feel. I felt like stitching and lots of layers were in order, so I pulled out my We R Memory Keepers Stitch Happy sewing machine. Can I tell you, it is so much fun to work with! I LOVE the beautiful thick stitches around the layers on this layout. 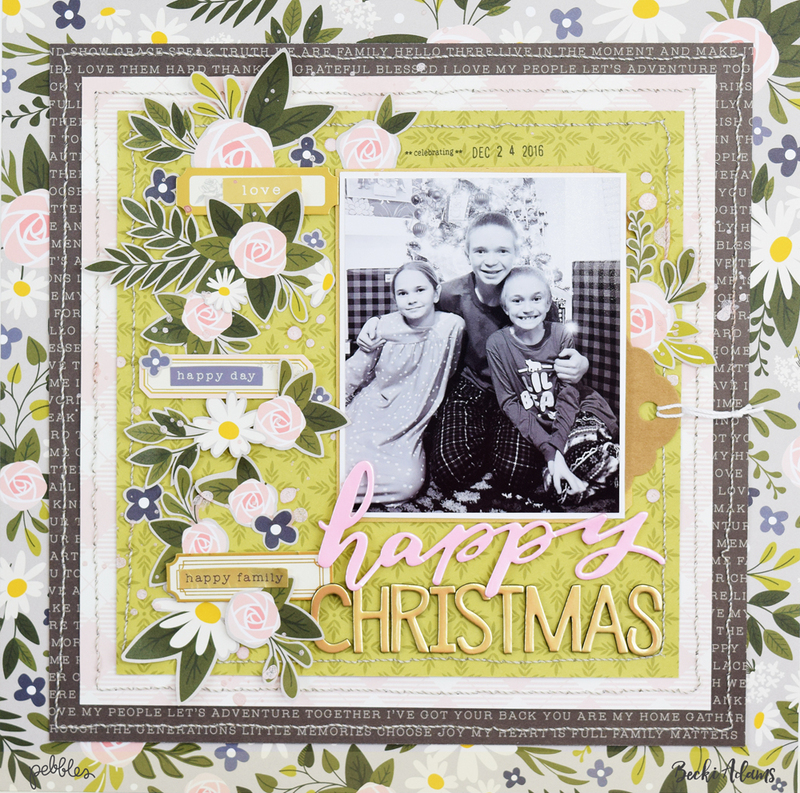 Oddly enough, I did use a Christmas photo on this layout even though this isn’t a Christmas-themed collection. Most of my Christmas photos are taken in poor light so I often print them in black and white. By printing my Christmas photos in black and white, I’m able to use any kind of products to document my Christmas memories. 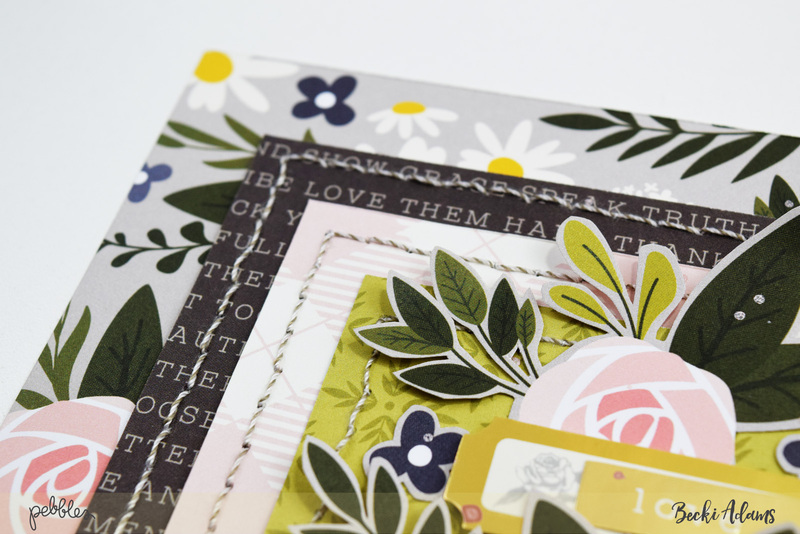 The label stickers in this collection are gorgeous and SO full of possibilities. I used them to nestle into the flowers as a base for some tiny word stickers. Hidden journaling is one of my favorite techniques lately. I used a basic kraft tag and a black journaling pen to handwrite my journaling. It is very important to me to have my hand writing appear frequently in my scrapbooks. 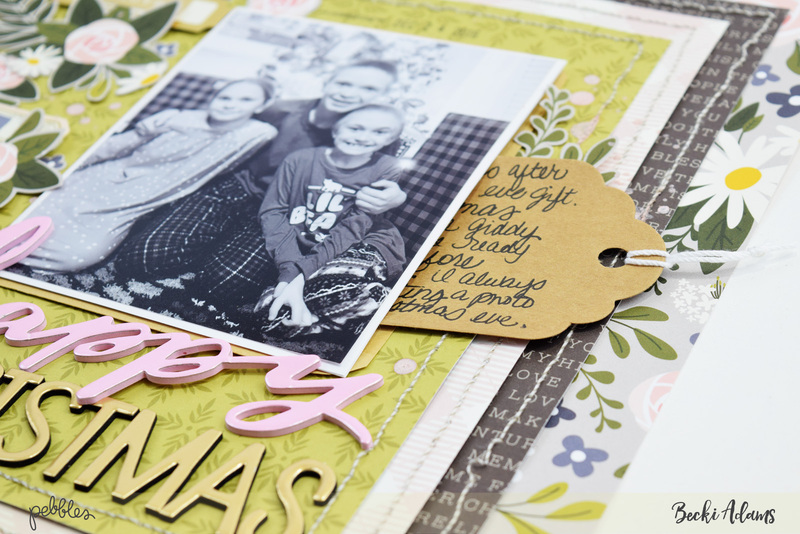 I do love how this layout turned out and I LOVE this brand new Heart of Home collection. As you can see, this collection is extremely versatile and completely gorgeous! Thank you for stopping by the Pebbles blog today. I’ll see you again soon! 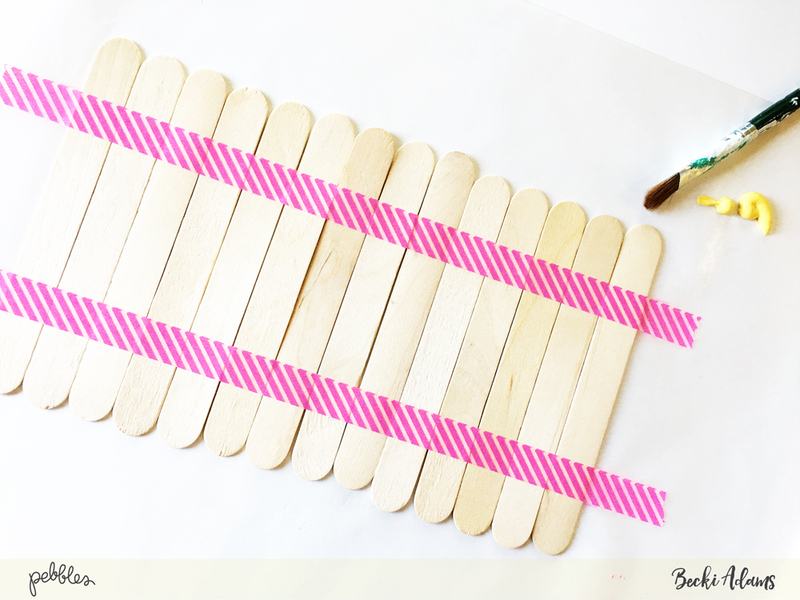 Hello Pebbles friends and fans, Becki here to share with you a fun summer activity idea. If you’re a mom, you know that “mom, I’m bored” phrase comes a LOT during the summer months. 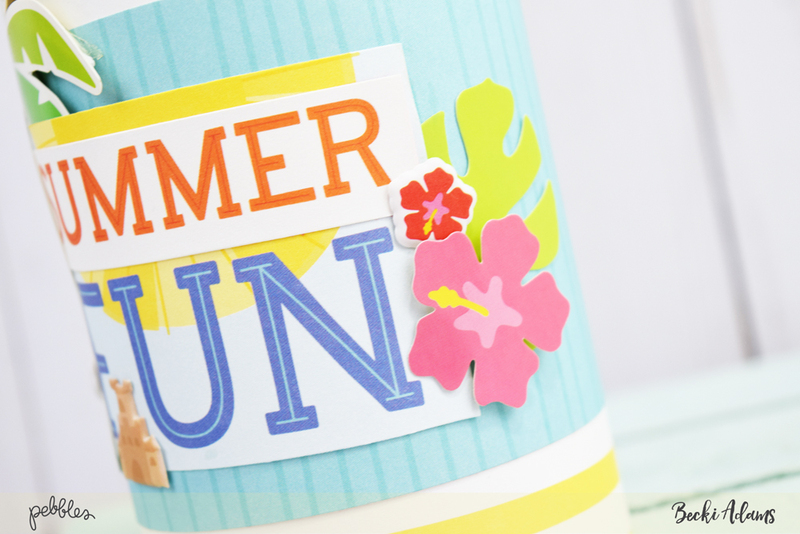 To keep that question from popping up All.The.Time, I created this fun summer activity idea jar using the Sunshiny Days collection. I started by gathering a few supplies from around the house. Other than the Sunshiny Day collection, all I needed was a few large Popsicle sticks, a tin can, and some craft paint. 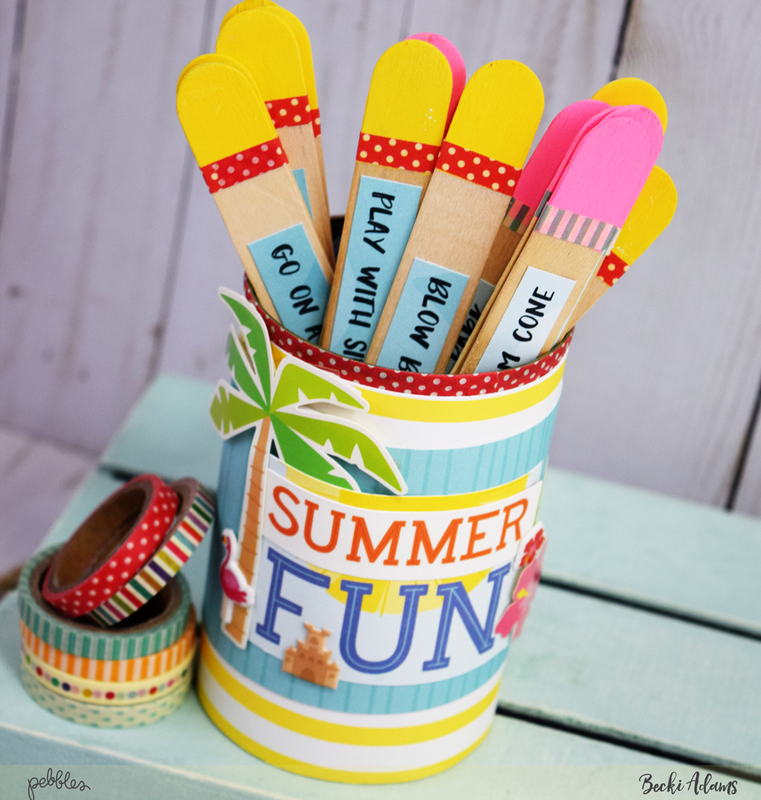 The first step in creating this Summer activity idea jar is to paint the ends of the Popsicle sticks. 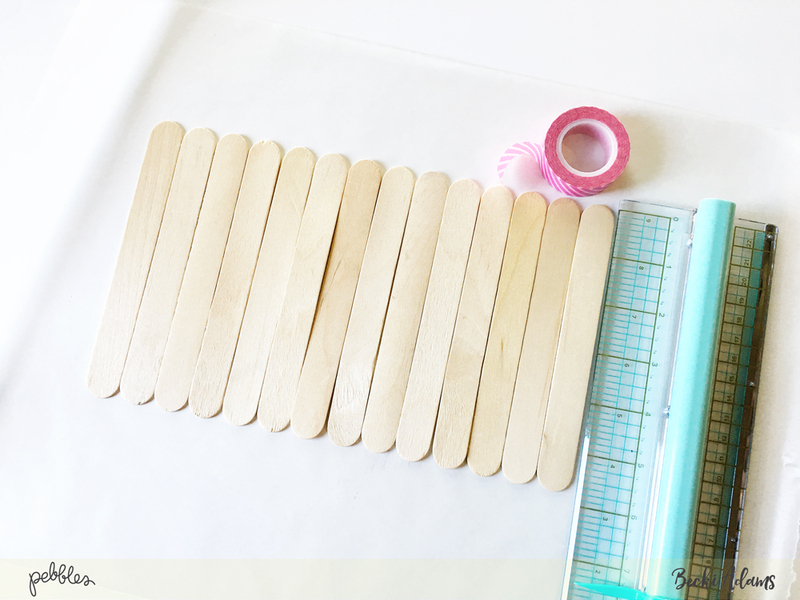 The washi tape on either end of the popsicle sticks is to keep the paint lines nice and neat. I chose to paint one end yellow and one end pink. You don’t have to paint them yellow and pink but they do need to be two different colors. When you use the Summer activity idea jar, you choose an activity and when you complete the activity you flip the stick so the opposite color of the stick is showing at the top of the jar. When the paint was dry, I wrapped each stick with washi tape. The jar itself is really easy to make. 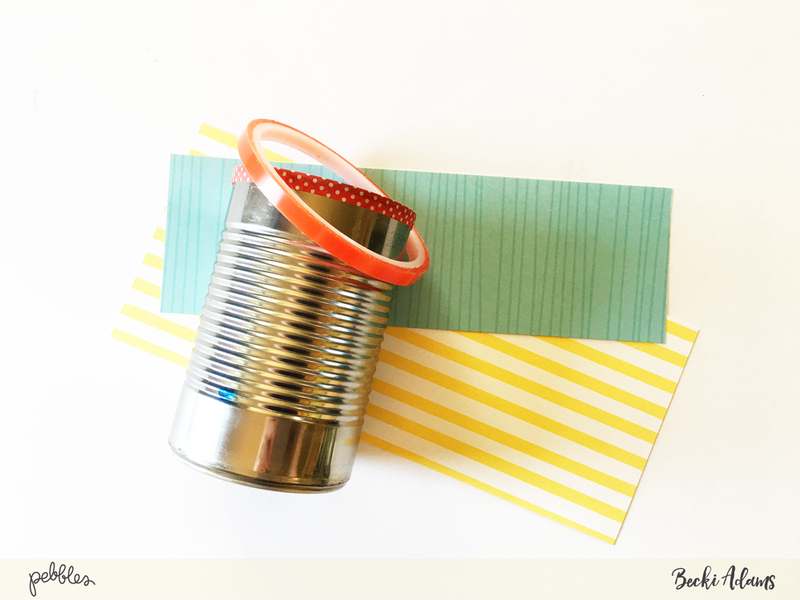 I used a basic tin can and covered it with patterned paper. The redline sticky tape is to adhere the paper to the tin can. I wanted to make sure that the patterned paper stuck to the can very well. If you’ve ever used redline sticky tape, you know how strong it is. 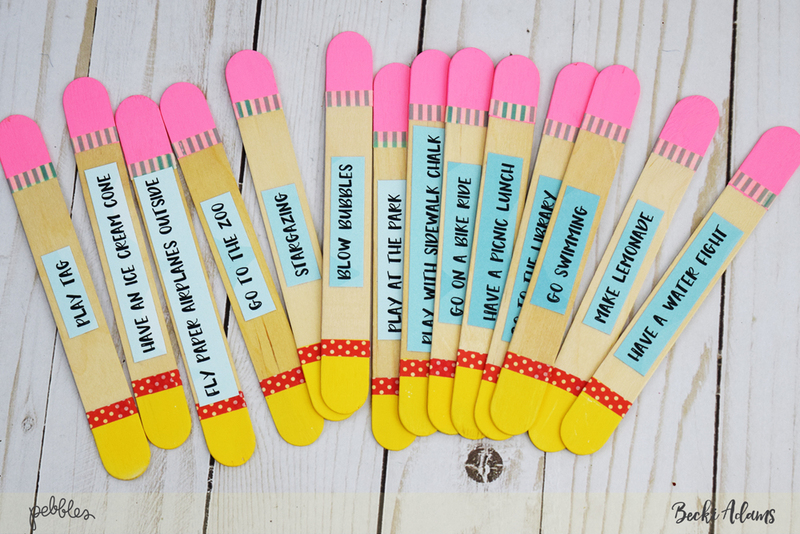 To finish the jar, I printed several summer activities on patterned paper, cut them into strips, and adhered them to the painted Popsicle sticks. 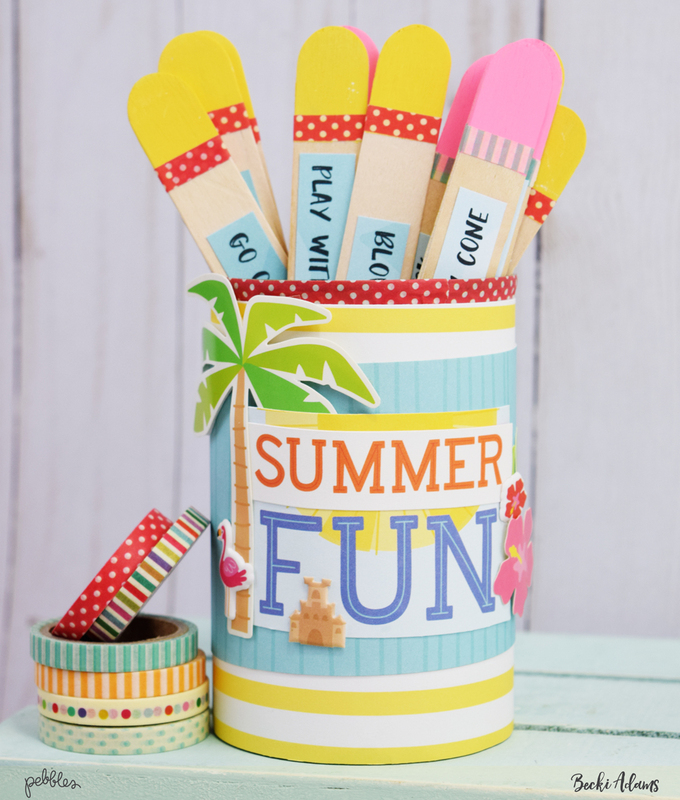 I know my kids will put our summer activity idea jar to good use! How do you keep summer boredom at bay at your house? 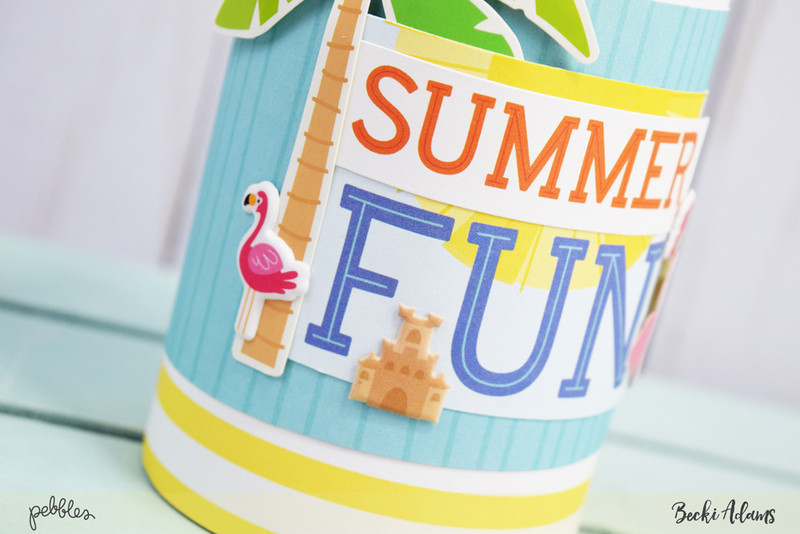 Grab the Sunshiny Day collection and make your own summer activity idea jar for your house. Thank you for stopping by the Pebbles blog! Hey there Pebbles friends and fans, Becki here to share with you a quick summer gift that I created using the Sunshiny Days collection. Summer has finally arrived in my neck of the woods. The kids are out of school and we’re ready to take it easy. During the Summer, I like to have a few gifts on hand to take to parties, bbq’s and reunions. 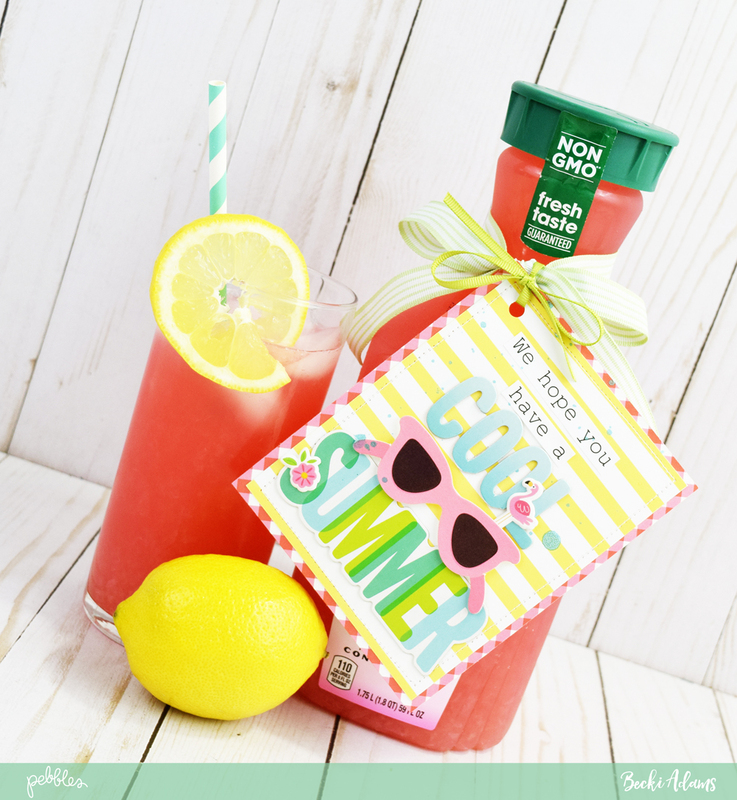 I created this quick summer gift within just a few minutes! The Sunshiny Day’s collection made this project SO easy! All you’ll need is some patterned paper and a few stickers. Before I cut the patterned paper for this tag, I actually put the stickers in place. By placing the stickers in place first, I was able to trim around them without wasting any patterned paper. I chose “Have a cool Summer” for the sentiment on this tag. For this first project, I tied the tag onto a bottle of raspberry lemonade. You could also use the same sentiment for a box of popsicle, ice cream, or another cold beverage. Because this tag is on a gift, I made sure to add extra adhesive to each sticker so they will all stay in place until the gift is given. I wanted to give the tag a little bit of shimmer so I sprinkled some teal shimmery ink on top of the tag. I punched a hole in the upper left corner of the tag and tied the tag onto the bottle of lemonade. It’s that easy! 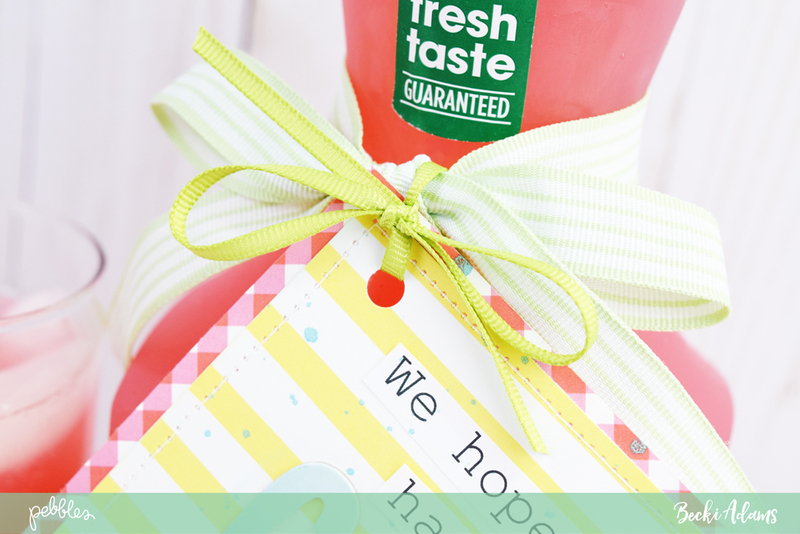 Next time you need a quick summer gift, just create a quick tag and tie it onto a “cool” gift. Thank you for stopping by the Pebbles blog, I’ll see you again soon!! What quick summer gifts do you plan on creating this Summer? I’d love to see what you’ve been making!